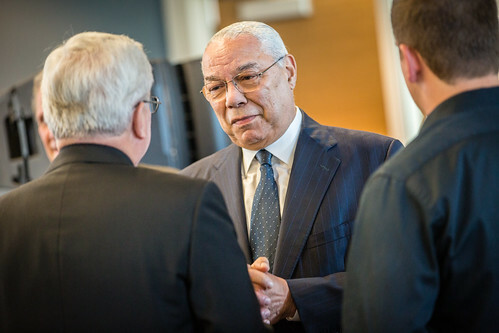 Nearly 100 of Chicago’s corporate leaders attended a CEO Summit featuring General Colin L. Powell, USA (Ret. ), and a panel of executives early Tuesday evening. The summit kicked off Quinlan’s Signature Series of events. In addition to Powell, CEO Summit panelists were Shaun Budnik, KPMG, LLP, partner; Robert L. Parkinson, Jr., Baxter International chairman and CEO; Paul La Schiazza, AT&T Illinois president; and Edward Wehmer, Wintrust president and CEO. AT&T Illinois was the CEO Summit Investor. The panel and guests discussed the impact of corporate social responsibility on business, government, and education, and the benefits to balancing shareholder and stakeholder interests. Photo gallery: View the photos in the gallery above or on Loyola's Flickr page. In his remarks, La Schiazza said the summit’s focus on corporate social responsibility was important, timely, and to him, inspiring. According to La Schiazza, good corporate governance is a necessary foundation for ethical and responsible business practices and directly relates to business success. Powell focused on purpose, saying that every business needs to think beyond its business goals and consider how to improve the community around them. He stressed the importance of continued involvement, challenging businesses to “Get involved and stay involved.” To drive home the idea, Powell recounted the story of US Senator Ted Kennedy volunteering an hour of his time each week to read to elementary students. Panel moderator Pamela McCoy, a Quinlan associate dean, asked panelists to discuss how industry, government, and academia can collaborate to positively impact the common good of our local and global communities. Parkinson, (BBA ’73, MBA ’75) and chairman of Loyola’s Board of Trustees, stressed that conversations between the different entities are critical, and he encouraged more dialogue among them. Budnik said there are many challenges to collaboration, including how government decisions on spending can negatively effect educational institutions. The CEO Summit was part of a full day of celebrations for the Schreiber Center, Quinlan’s new home on Loyola’s downtown campus. Nearly 500 people attended the Schreiber Center Grand Opening Celebration, which also featured remarks by Powell. Read the story. Among those in attendance at Tuesday evening’s gala were Chicago Mayor Rahm Emanuel and benefactors John and Kathy Schreiber. See the pictures. WGN Radio hit the airwaves from the Schreiber Center. Hear a love song to Loyola—plus interviews with Interim President John P. Pelissero, PhD, and other Loyolans. Listen to the broadcast. An advertising blitz declared Quinlan's new Schreiber Center "open for business." See the ads.